Waiting to start is when we are our most uncomfortable; nobody trains for that. Right now – all those media people are waiting for something “Olympic” to happen so that they can have an opinion and talk about it. But until the Opening Ceremony, and then when the first medals are presented, all these media people need to fill space. Before the London2012 Games it was traffic, before the Vancouver2010 Games it was weather, Beijing2008 was air quality (and human rights)… and the list goes on. Without question it is prudent to be concerned about the current situation in Russia. Athletes aren’t blind to what’s going on but they have been trained to control the controllables and focus on their task. At this time, they are focused on their sport performance and are increasingly blocking out everything else. This includes logistical issues, social media discussions, friends and family distractions, as well as sponsor and media distractions. Athletes have very talented support teams around them; their coaches, national sport federations and the Canadian Olympic Committee who’s responsibility is to be aware of potential security threats, have an emergency plan and ‘watch the athlete’s back’ so they don’t have to. 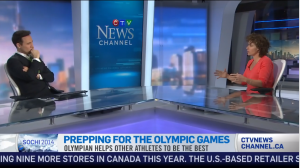 CTV News Channel: The Olympic experience : Mentor Marnie McBean explains her role as an Olympic athlete and how to prepare an athlete for the pressure of the games. Here is the link for the 5min discussion I had on this….